I have distinct memories of blue cheese lingering on my taste buds. The flavor has been lingering for a few weeks…every since the Spicy Chicken Chili. In clearing out the freezer, I found 2 baggies of chicken breasts that I had frozen with Frank’s red sauce as a marinade. Trying to figure out how to use it up in a fun, clever way wasn’t too hard. These blue cheese memories were lingering in the forefront of my brain. And with all the buffalo chicken dip talk with the Super Bowl happening this weekend…these enchiladas seemed to be in order. I had corn tortillas leftover in the freezer from the last enchiladas I made, as well as the shredded cheese. I had the canned tomato sauce in my stockpile, so the only ingredient I needed to purchase for this meal was the blue cheese. I managed to squeeze that into this past week’s very small grocery budget. And even though our green couch is in the dining room, our (we cleared out our playroom to do some painting and deep cleaning…then rearranging before we list the house) dinig table is covered with toys, an Ikea trofast shelf and more. But we needed a night in, after a few meals out earlier in the week…so I made these enchiladas for my husband and I…and I made the kids some “cheeseless” buffalo chicken wraps, using the last of the flour tortillas that we had. I dropped the partially thawed chicken and Frank’s hot sauce marinade into the slow cooker, high for 6 hours. Once finished, I shredded it with 2 forks. 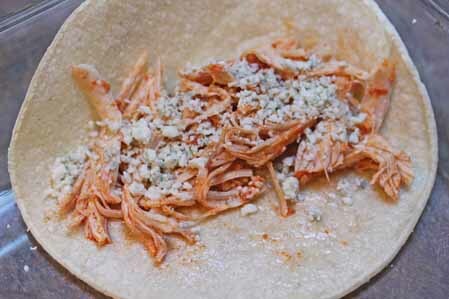 Drop a couple forkfuls of shredded chicken into a corn tortilla, then sprinkle blue cheese crumbles on top. Roll, seam side down…and stuff the pan full. I got 12 enchiladas into a 9×13 comfortably…probably could have squished in 2 or 3 more. Mix taco seasoning into the tomato sauce (like I did here)…this is not lazy, it’s efficient! Pour the tomato sauce over top. Then the cheese. Then the bake. Then cool a bit. Then let the taste bud explosion begin. Frank’s hot sauce, as marinade (free) from a sale and coupon long ago! 12 corn tortillas ($.50) Aldi sale! 1 15 oz. can tomato sauce ($.25) Last week’s Kroger sale! Marinate the chicken breasts in the Frank’s hot sauce. (I used 1 jar to marinate 4 chicken breasts, in 2 bags for 2 meals.) 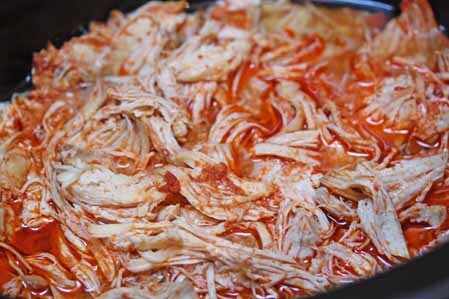 Or if using already cooked shredded chicken, add 1/2 cup-ish of sauce to the chicken. Combine in a bowl. Slow cook the uncooked chicken and sauce for about 4 – 6 hours on high, if needed. Shred with forks when cooked through. 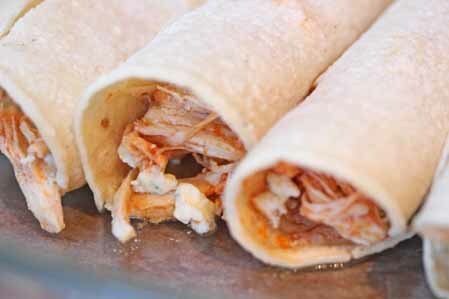 Spoon shredded chicken and red sauce into the corn tortillas. Sprinkle blue cheese crumbles over top. Roll and place in baking dish seam side down. Stir the taco seasoning into the tomato sauce. 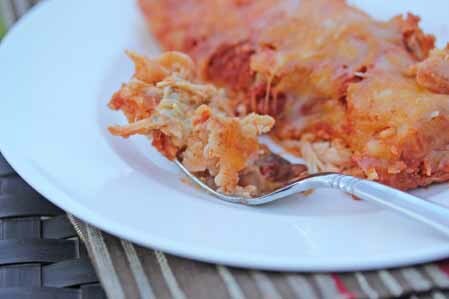 Once the pan is full, pour the tomato sauce over top of the enchiladas. Then top with the shredded cheese. Bake at 350 for 20 to 25 minutes, or until cheese has melted and sauce is bubbling. Let cool slightly before slicing and devouring. Cost $8.74 Definitely worth the splurge! Just curious, did you get your kids to eat this, as is? I very much want to try this, but the time I tried Frank’s red hot out with my kids (on some hot tots), they said it was too hot, and blue cheese is usually too mature of a flavor for them. I guess I’m wondering if maybe the extra sauce and cheese tones it down a bit? Thanks! I’m wondering the same thing! Maybe I’ll make this on a “stay home date night”. wow, definitely takes two of my favorite items (bleu cheese) and buffalo chicken and puts them together in a way I never thought of! Except in my case I’m totally going Sriracha sauce instead of Franks! For low prices on free range/ no hormone/ no additive chicken try this website http://www.communityfoods.com. Won’t believe the prices! I just read this to my hubby and our mouths are drooling! This is being eaten this week in our home. We live in Buffalo and Frank’s is the ONLY hot sauce to use! I can not believe I had not thought of this before!